I'd been "good" in terms of purchasing frivolous cosmetic things and by good I mean straight up not buying them. I promised myself I'd be "good" for the rest of the year. However, when I visit my sister, sometimes it's the perfect storm of laughter, enthusiasm, and craziness to get me swiping my credit card. This time our target was the Tony Moly flagship store that recently opened in NY. My sister and I have fallen completely in love with Asian Beauty products, from "My Beauty Diary" facemasks to Majolica-Majorca blushes to Etude House Liptints. In the past couple of years Korean Cosmetics and Skincare have truly taken center stage with their packaging, efficacy, and quality. I originally wanted to purchase some Korean skincare from Sephora but my sister suggested heading directly to the source: the Tony Moly flagship store in K-town. Well, I went a little crazy at Tony Moly and I just wanted to share that craziness with you. 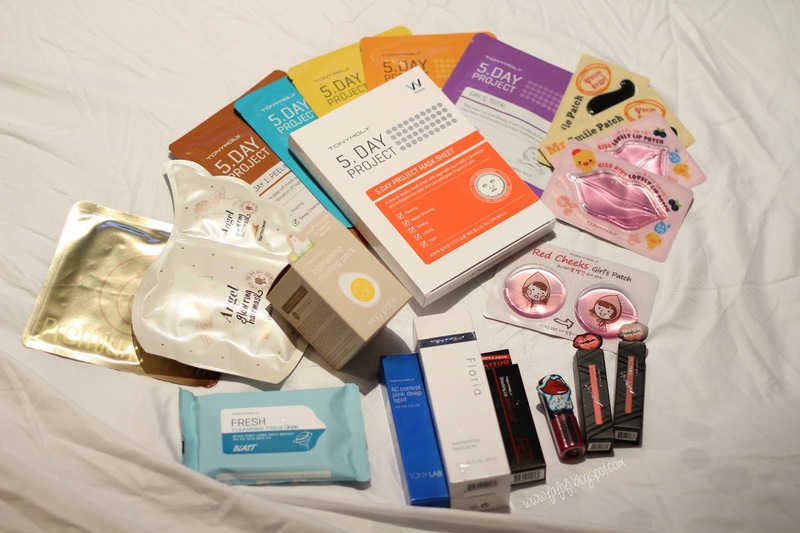 I'll also review these products individually as the weeks pass, so keep your eyes peeled! I've included non-referral purchase links underneath each product photo. 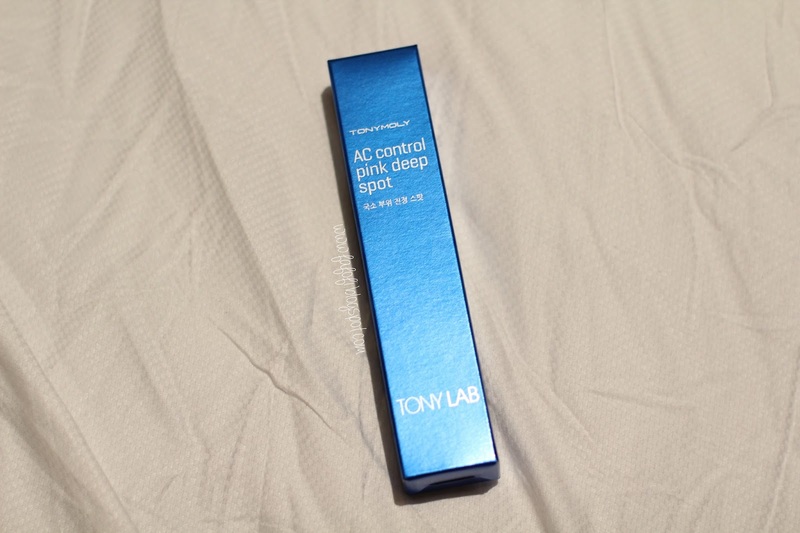 The US Tony Moly site doesn't have a complete roster of all their products yet, so I've included retailers like Amazon, Ulta and anyone who offers the exact product I purchased. Please buy at your discretion! The prices I've listed below are what they cost in the store. I think everyone's initial reaction when they hear "snail gel" is to cringe. Snail gel in beauty products is a tough sell. 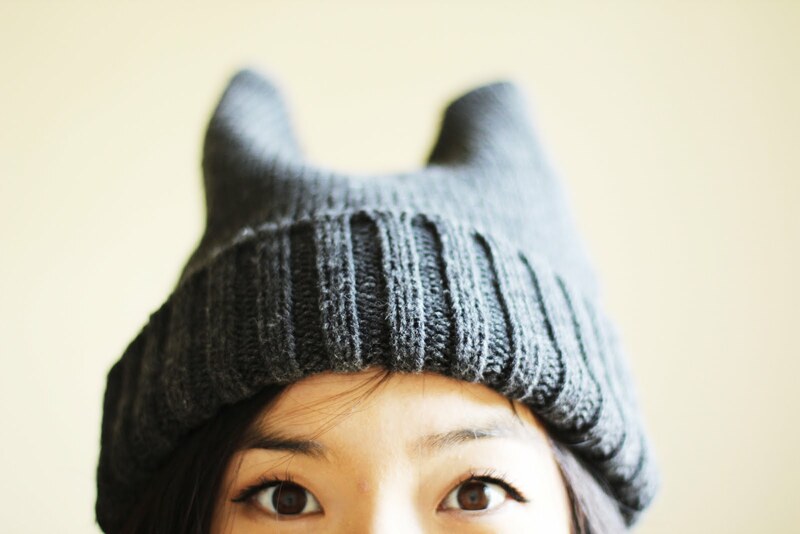 However, scientists recently have discovered that Snail Gel has incredible benefits for the skin. It's incredible at diminishing fine lines and wrinkles and has benefits for acne, acne scarring, hyper-pigmentation and dryness. Less cringe worthy, right? My sister and I decided to try out the snail essence mask in it's "hydrogel" form. Very excited to try this guy out! A single mask retails for: $9.00. Tony Moly had so many different and adorable masks it was hard not to go crazy and get them all. Their packaging is so ON POINT. I'm so easily mind-melded by the packaging, I'm shocked I didn't walk out with the whole store. However, this particular box caught my eye. It was so plain in comparison to the rest of the store and very to the point. 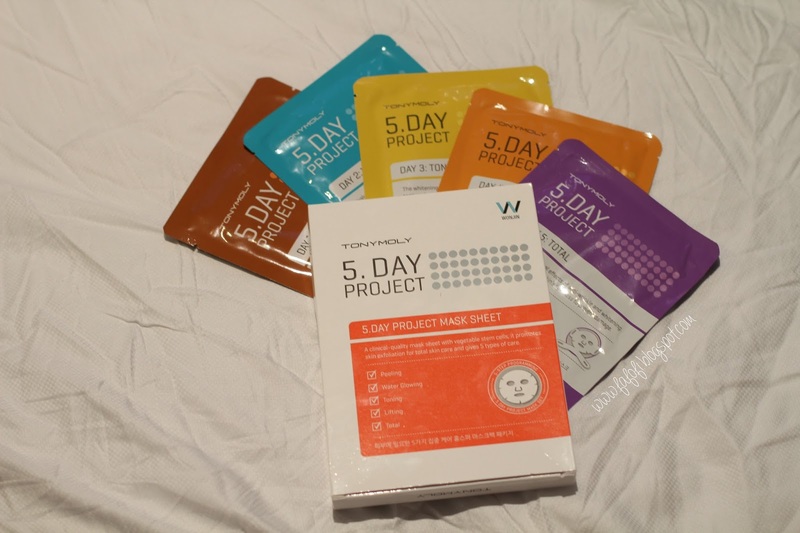 5 Clinical Grade Masks for use 5 days in a row to improve your skin. Easy! I grabbed it and stuck it in my bag. Imagine my surprise when I got to the cashier and it rung up as the most expensive thing in my entire haul. This 5. Day Project Mask set retails for $54 dollars. My sister and I are always on a quest to get fabulous hair. Tony Moly had a cute assortment of hairmasks, but my sister and I were most impressed by this one. Not only becaue of the cute angel wing design, but also because it had an extra sachet of hair essence to slather on your hair in addition to an essence soaked "shower cap." I bought these because they were so dang cute. LOOK AT THEM. Little hydrogel masks that you stick on your laugh lines. I love beauty items with a self reflective sense of humor. They were also the only product that the boyfriend was interested in! So obviously I purchased one for him as well. I think when we try these out we're going to be taking lots and lots of selfies. I purchased these for the same reason I purchased the "Mr. 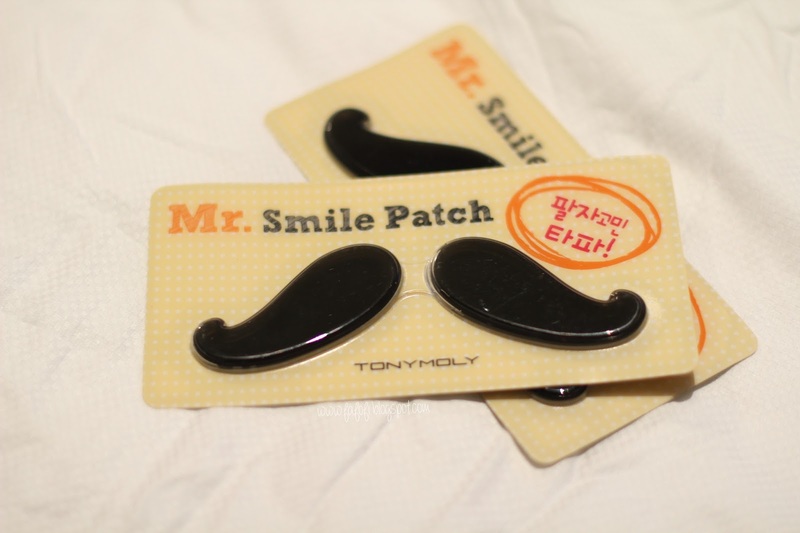 Smile" lip patch: they're so dang cute! 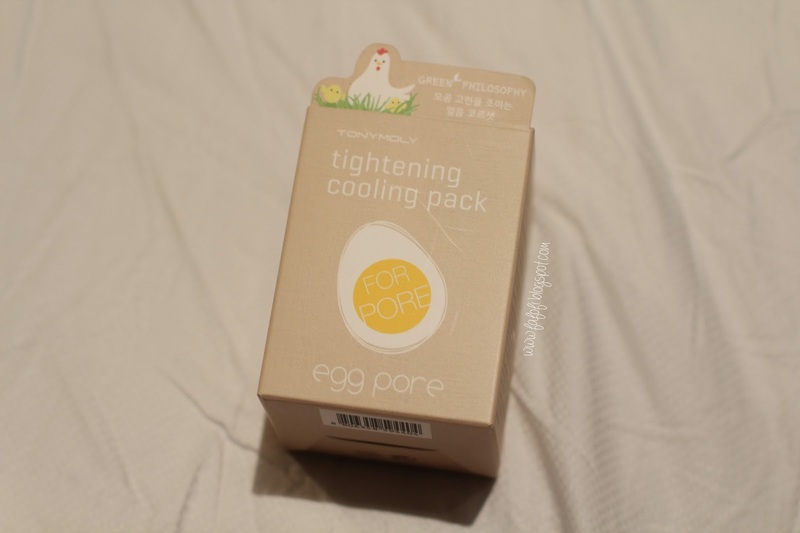 I also am a Jenn Im acolyte and she reviewed this lip mask in one of her videos so I too had to give them a try! My lips have been extremely dry lately and this seems like a good thing to do when I'm not feeling in the mood for slapping on a whole face mask. As with the two little hydrogel masks above, I couldn't resist this "little red riding hood" themed mask. I have extreme red cheek problems due to acne, acne scarring, and general irritation. I know this mask won't cure everything, but I'm looking forward to the refreshing effects of the essence infused hydrogel. I actually purchased this by accident...I thought this was the black head treatment, but it was not. I'm not sure about this one, but you can never go wrong with a kaolin clay mask! Especially if you have acne prone skin like I do. The service in the store was...definitely below par. They were quite busy, but there were just some things that rubbed me a little bit the wrong way. One of them was that the cashier actually charged me for this mask twice...it retails for $17.00 so charging me twice....wasn't cool. This retails for $17 dollars. I needed a acne spot treatment and this was suggested to me by one of the more helpful sales associates. It has calamine and centella extract to help sooth cystic angry pimples and uses kaolin clay to help dry them out. If there's one statement on my blog that I've said over and over again it's that my ultimate cosmetic weakness is for lip products. I'm just in love with them and Korean Lip products just consistently knock my expectations out of the park. 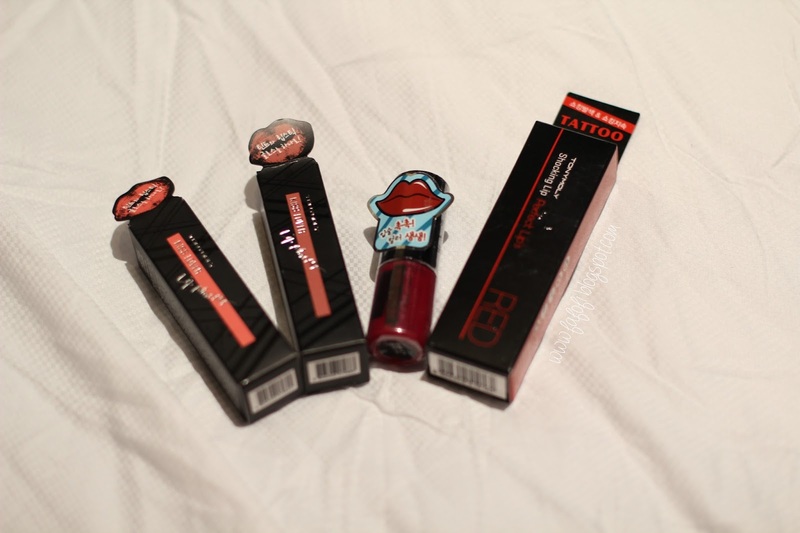 I'm excited to try all of these and I'll be giving each type of lip product a thorough review. Kiss Lover Lip Master retails for $14, Kiss Lover Live Tint retails for $11, and Perfect Lips Shocking Lip retails for $22. 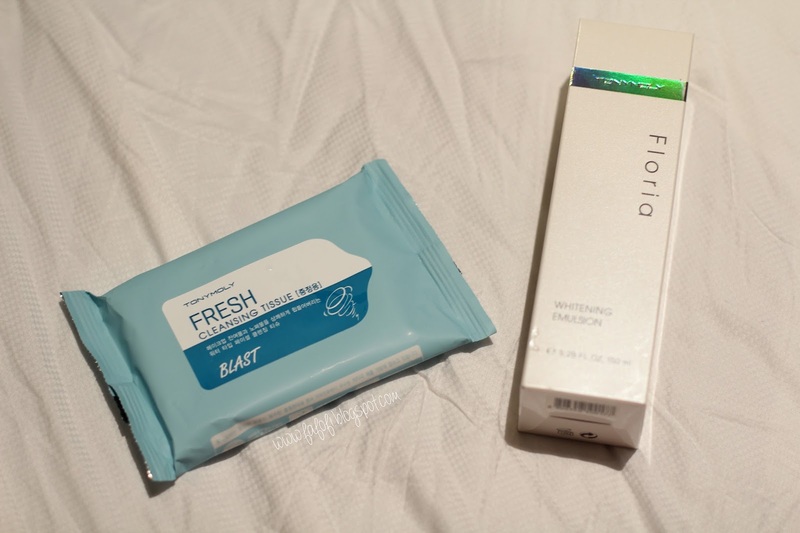 With all the money I spent they also gave me two freebies: their makeup remover wipes and a full size of their Floria Whitening Emulsion. If you're interested in Tony Moly, I've linked their website here! They're also running a promotion where you'll get 5% off your purchase to celebrate the grand opening of their flagship store. So feel free to splurge online! So long as the promotion is running, purchasing products online right now is cheaper than in store. @Synthia Maramis Absolutely! I've actually personally really liked the Shocking Red so far!! I'm so jealous you got the pink one! It was sold out when I went. I think the staying power of this lipstick is incredible! For the shocking red, I just have to take photos, but keep your eyes peeled! It should be here soon! Thanks for reading!! 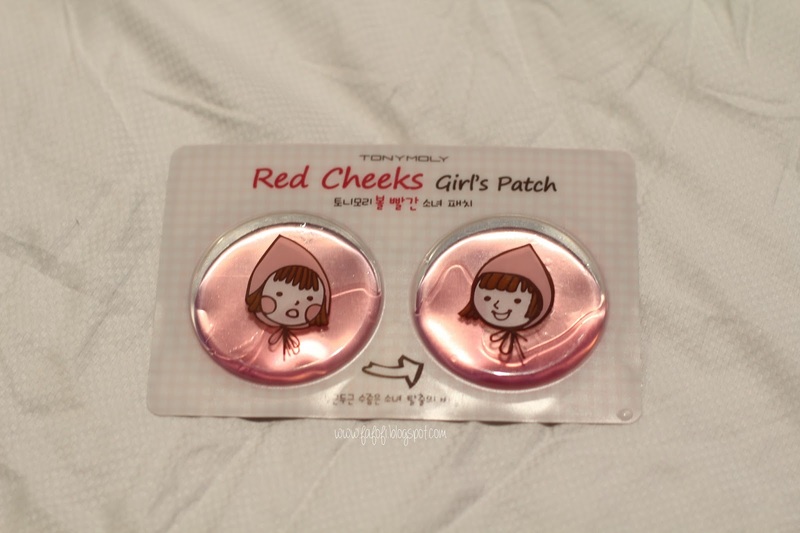 Tony Moly Angel Glow Ring Hair Mask - Review!